We run the Real Madrid Social-Sport Academy after-school program at eight Arlington public schools where the proportion of students who qualify for free and reduced-price lunch ranges from over 50% to nearly 90%. Each of the participating schools chooses the students that they believe would benefit from the attention, structure and encouragement this program provides – kids who are struggling with academics, behavior or a challenging home environment. For many of these kids, the program is their only opportunity to get outside and be active after school. The after-school program closely follows the students’ in-school performance. Students have to be in good standing with their homework, in-class assignments and conduct in order to be able to participate each week. The discipline that the students receive from their teachers translates to consequences on the field, including yellow cards and sit-outs. Students learn that the best way to continue to play and have fun with their friends is to maintain their academics, attendance and behavior. 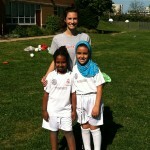 My students love the after-school soccer program! They feel special because they get to participate in something extra special and fun (not academic after a long day of school). They really like how it is sponsored by Real Madrid and how real soccer coaches are working with them. They also understand it is a privilege that needs to be earned by great behavior and hard work. The program helps me motivate students to keep them working hard and trying their best. It is a great incentive!